Wow! Look at that pretty tree over there; wonder what kind of tree that is? It has beautiful flowing cascades of golden yellow flowers that seem to be almost raining from the tree. What’s that you say? 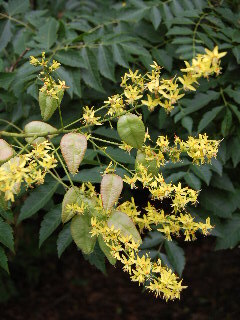 It’s a Panicled Golden Raintree? Okay, that makes sense; tell me more. Koelreuteria paniculata is the scientific name for this unique and showy specimen tree, an unusual shade tree that is now commonly planted in the United States but actually originated in Asia. The leaves of the tree are large and compound and densely formed and heavily clustered onto the rounded shape of the raintree. The profile of this remarkable shade tree in the landscape is that of a specimen that is just about as wide as it is tall and almost circular in appearance. The streams of golden flowers form on the tree in the late spring into early summer—a nice flowering time, since many of the earlier blooming varieties of trees and shrubs have already finished their springtime show. The seedpods that form are about 1 to 2 inches in length and resemble paper Chinese lanterns! Early on, the seedpods are a pale yellowish green color—then they begin changing to a muddy deep brown as the season progresses on into the fall of the year. Remnants of the pods often cling to the tree throughout the winter. 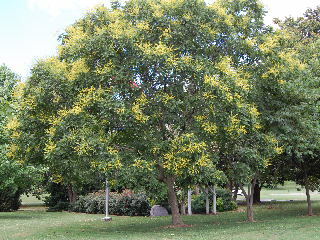 Other than requiring full sun for healthiest growth, the Panicled Golden Raintree is very undemanding of site conditions. It tolerates poor soils, drought conditions, and city air pollution. The tree will also survive in extremes of hot and cold, but cannot tolerate extended periods of sub-zero temperatures. It’s a popular tree for urban planters to use in parks and along city streets. Home gardeners also enjoy the exotic nature of these unusual trees in their landscape throughout the year. The trees can reach heights in excess of 30 feet and, as we said, about the same in total outward spread. So plan accordingly, if you do decide to incorporate one of these beauties into your grounds.